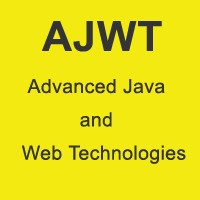 Scoopworld provides online material Advanced Java and Web Technologies of JNTUH,JNTUK,JNTUA Ebooks,PPT'S and PDF materials download for semester preparation. Scoopworld provides ebooks,text books,study materials ,ppt and pdf files for CSE, ECE, EEE, MECH, CIVIL AND IT branches.Subscribe to our newsletter for our updates. Also like our Facebook page.